Consider this the best news you’ll get all year: we want you to eat more chocolate. That is, more dark, un-“Dutch”ed, solid high-cocoa chocolate. The dark stuff (when it isn’t encasing sugar-laden caramel, nougat, or peanut butter) is rich in flavanols and polyphenols, two types of naturally occurring compounds that act like antioxidants in the body. And because their concentrations are so high (even higher than in red wine), doctors and medical researchers continue to prove a little chocolate can go a long way in preventing disease. 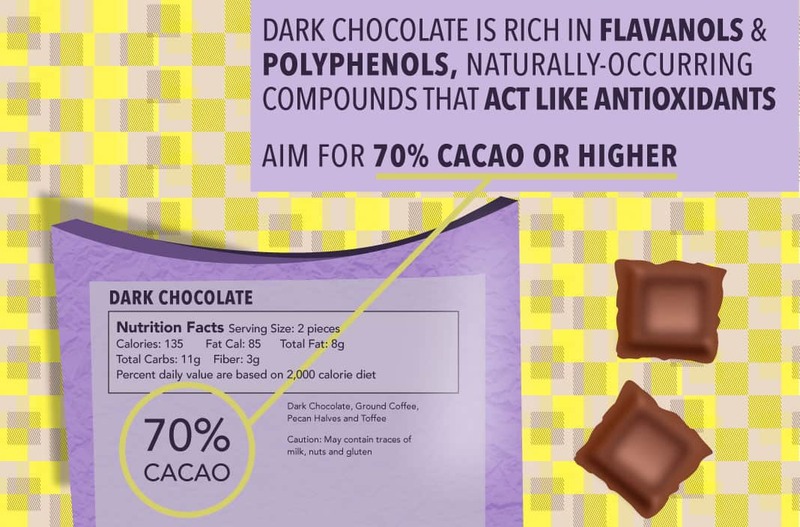 Grab an ounce of the dark stuff (aim for 70% cacao or higher) and check out these 6 health benefits of chocolate and start using them to justify a trip down the candy aisle. Ready for a reason to eat dessert first? In a Danish study, participants who consumed 100g of dark chocolate two hours before a meal at 15% less calories and were less interested in fatty, sweet, or salty foods than those who ate 100g of milk chocolate. That’s because dark chocolate is full of fiber and monounsaturated fats which keep you feeling full and helps regulate blood sugar. Okay, so maybe you already know that. But here’s the science behind it: chocolate contains anandamide, a compound that activates the same brain receptors that marijuana does, as well as phenethylamine which prompts the release of feel-good endorphins (the same kind you get from exercise or falling in love). Talk about a good mood food! Yes, chocolate contains saturated fats. But like coconut oil, those saturated fats (mainly from cocoa butter) contain stearic acid, which doesn’t raise your bad cholesterol, according to Will Clower, PhD, author of Eat Chocolate, Lose Weight. “Your liver converts it into oleic acid, which is a heart-healthy monounsaturated fat,” he writes. 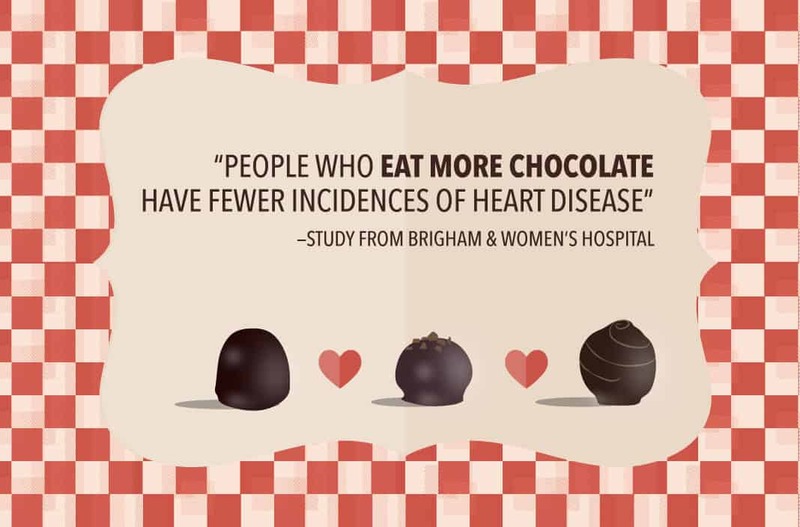 In fact, a massive study out of Brigham and Women’s Hospital in Massachusetts found people who ate more chocolate (the healthy kind) had fewer incidences of heart disease—and the more they ate, the better the protection. Go ahead and call bluff on the old chocolate will rot your teeth debate. The polyphenols in high-cocoa chocolate decrease the formation of biofilm and acid on your teeth caused by bacteria. The antibacterial protection comes from the cocoa bean husk, writes Clower. It’s also high in theobromine, a proven enamel hardener. Sounds like a pretty good argument for chocolate toothpaste, if you ask us! When it comes to cognitive function, good blood flow is your best friend. Cocoa is known to improve the flexibility of your arteries, and recent studies indicate chocolate is a great way to keep the pathways open. A Brigham and Women’s Hospital study of 60 adults who drank hot (dark) chocolate twice a day showed a boost in their brains’ blood supply and an 8.3% increase in blood flow after just 30 days. Participants consumed just 50g—a little more than 3 tablespoons—a day, so it’s possible to get the benefit without impacting your waistline. Sick of popping half-a-dozen supplements every morning? Reach for an ounce of dark chocolate instead. High concentrations of potassium and copper can help prevent stroke, ample iron content keeps anemia at bay, and magnesium plays a part in chocolate’s expert blood sugar regulation abilities, which is great news for diabetics. You’ll also find fiber, vitamins A, C, E, and D, and phosphorous among the free radical-fighting antioxidants. What’s The Deal With Fats?